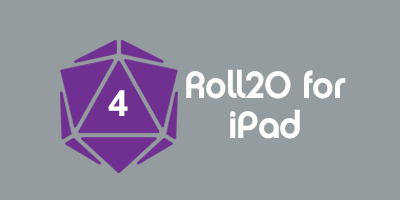 Live streaming allows you to broadcast, record, and archive your Roll20 sessions online - giving you an easy way to create and share roleplaying content with your fellow gamers! There are many different ways to stream and record content, but this wiki will focus the method used on by Roll20 on our Twitch page. In fact, you can see previous recordings if you want a preview of what the final product will look like. Note: Beyond Twitch, you can also broadcast to YouTube via Google+'s Hangouts On Air. See Broadcasting From Google+ Hangouts On Air for a walkthrough of that method. A Twitch page is required to follow this tutorial - to create an account head over to Twitch to sign up. Please refer to their support site if you have any questions outside the scope of this wiki. We’ll do our best to get you up and running with the basics, but there are features like sharing you previous broadcasts to YouTube, creating highlights, and chat that you might consider exploring further. Note: The following instructions have been verified to work on Windows 7 only. Download and install XSplit. There are several licensing options available, including a free version, a Personal License for $4.95 per month, and even a premium package at $8.95 per month for Professional Broadcasters. This software takes a screencast of your Roll20 session, both audio and video, and broadcasts it to your Twitch channel. 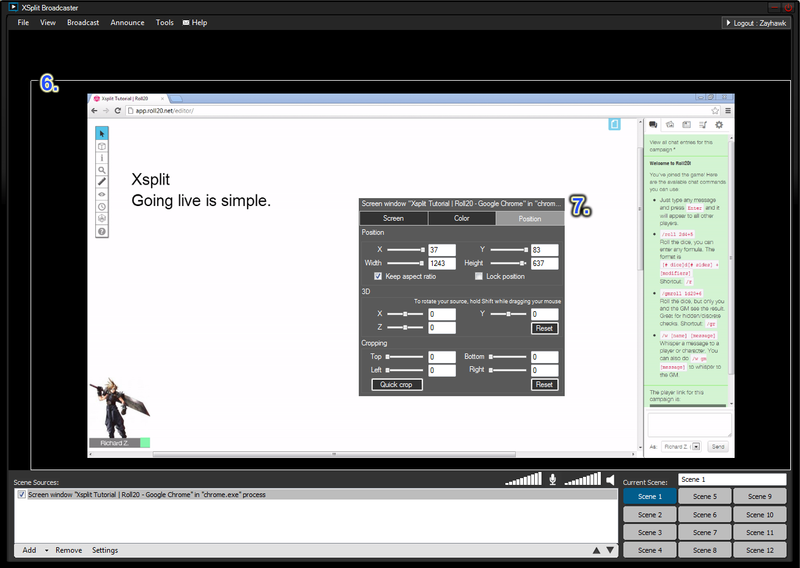 Now that XSplit is installed, you need to setup and configure it. Launch the program, You'll want to (1.) select “Scene 1”, then (2.) click on "File" and then (3.) select the "Add screen region" option. Then (4.) Red crosshairs will appear simply select the region you wish to screencast in this case (5.) the web browser you are using for Roll20. Once your Scene looks just how you want it to you are almost ready to broadcast. (8.) Click on “Broadcast” and then (9.) select the “Add channels” option. (10. 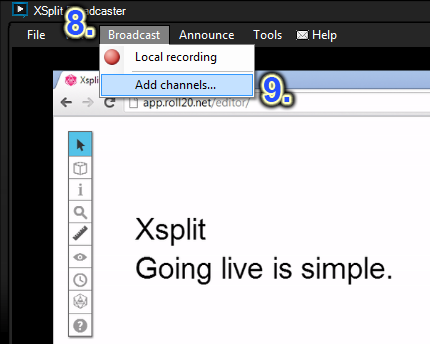 )The XSplit Broadcaster window will open, from here (11.) click the “Add” button and then (12.) select Justin/TwitchTV. 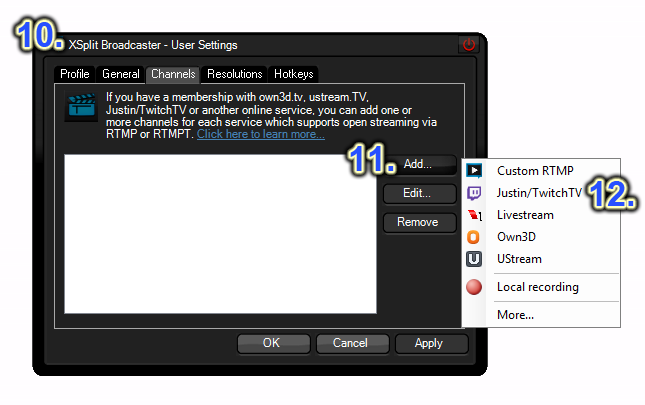 The Justin/TwitchTV properties window will open, from here (13.) enter all your Twitch Channel username and password , then (14.) click the “OK” button. 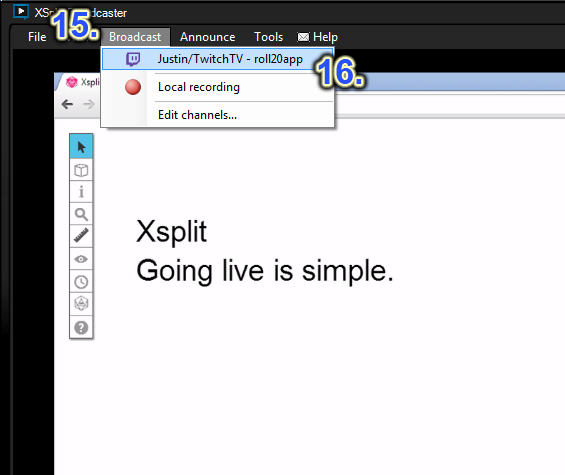 Click “Ok” again on the Xsplit Broadcaster window to close it. 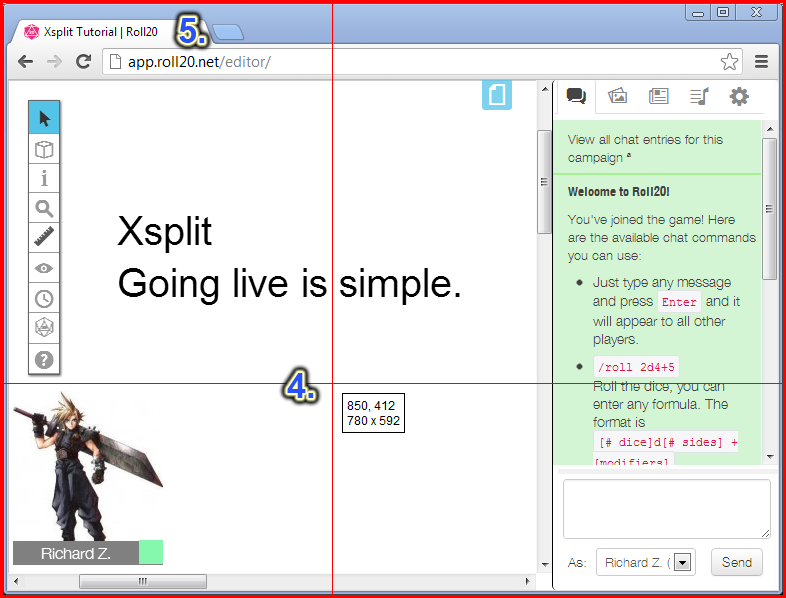 You are now ready to broadcast your Roll20 session via Xsplit to TwitchTV. Simply (15.) click on “Broadcast” and then (16.) select your Justin/TwitchTV Channel. To let others view your live stream while you're broadcasting, just send them to http://twitch.tv/your_twitch_username, for example http://twitch.tv/roll20app. When you first download the program, this is what you will see by default: empty scenes and sources. Before we get to adding scenes and sources to OBS, there are some settings to take care of first. Click the Settings button at the top of the program, then Settings again to open up a menu with various streaming preferences and features. The default settings will be perfect for most users right away, so don’t change any values that you’re not familiar with. Click on Stream Key, then Show Key. A string of letters and numbers known as your stream key will be revealed. This is a sort of address that tells OBS where to send your stream on Twitch.tv. Do not let anyone see your stream key, or they will be able to broadcast to your channel as well! Now that you have your stream key, go back into your OBS settings and click on the Broadcast Settings tab. You’ll want to set Mode to “Live Stream” and Streaming Service to “Twitch.” Once you do this, OBS will create an Optimize button at the bottom that optimizes your settings for use on Twitch.tv. Click Optimize and OBS will automatically change a few settings for you. Now just copy your stream key over from Twitch.tv and apply your changes. Your OBS is now “connected” to your Twitch channel and you will be able to broadcast to it whenever you like. 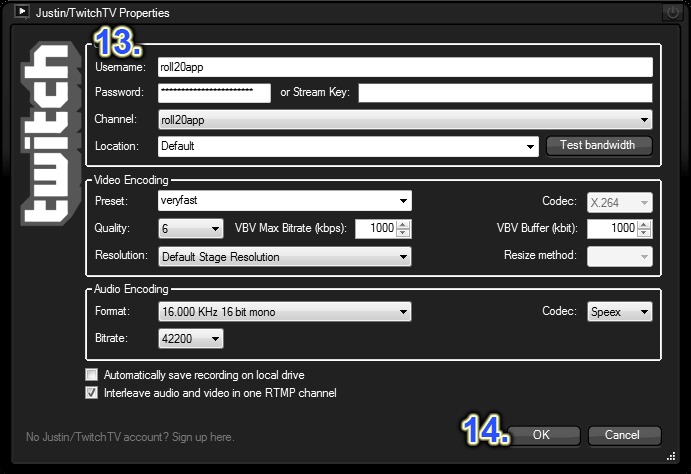 The last thing that we will do in OBS Settings is to change your Max Bitrate (kb/s) in the Encoding tab. If you have an upload speed higher than 5 Mbps, your Max Bitrate should be set to 3300 for optimal streaming. You can check your upload speed with the website http://www.speedtest.net If your upload speed is below 5 Mbps, lower your Max Bitrate accordingly. Now that we are done with our Settings, it’s time to add some content to our scenes! Make sure you’re logged into Roll20 and looking at the game board that you would like to stream, so that we can make sure it looks correct in our Preview Stream. The drop-down menu labeled “Window” will allow you to select the correct internet browser that you have Roll20 open in. Click “OK” and you will see “Game” appear as a Source. You won’t see the actual window until you click “Preview Stream” near the bottom right corner. Click “Preview Stream” to see your Window appear, then click “Game” and “Edit Scene” to resize and reposition your window to your liking. 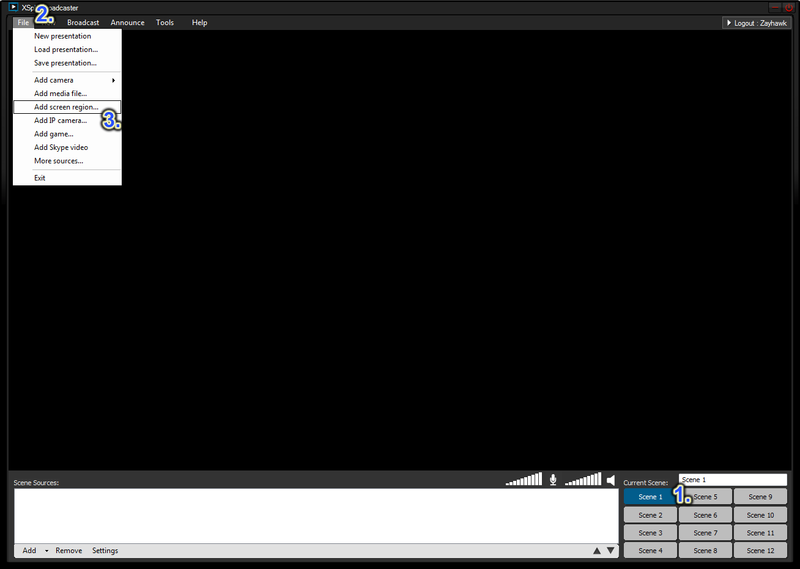 OBS allows you to add multiple windows, Images, and Text as scenes. Let’s add one of the Roll20 standard overlays by once again right-clicking the white box under Sources, Add, Image. Name the source “Overlay” and click OK. Browse for the overlay .png and use Edit Scene on either Source to get your Preview Stream looking just how you want it! Now that you’ve got the game and overlay looking the way you like it, click “Stop Preview.” Once you’re ready to actually go live with your stream on Twitch.tv, simply click “Start Streaming” and after a few seconds, your stream should appear as Live on Twitch! When it’s time to bring your broadcast to an end, simply click “Stop Streaming.” Be sure to practice before going online for a show for the first time. There are lots of moving pieces with streaming software and a large number of issues could come up. Take the time to be certain that your broadcast will look and sound like you intend it to before asking people to come watch! 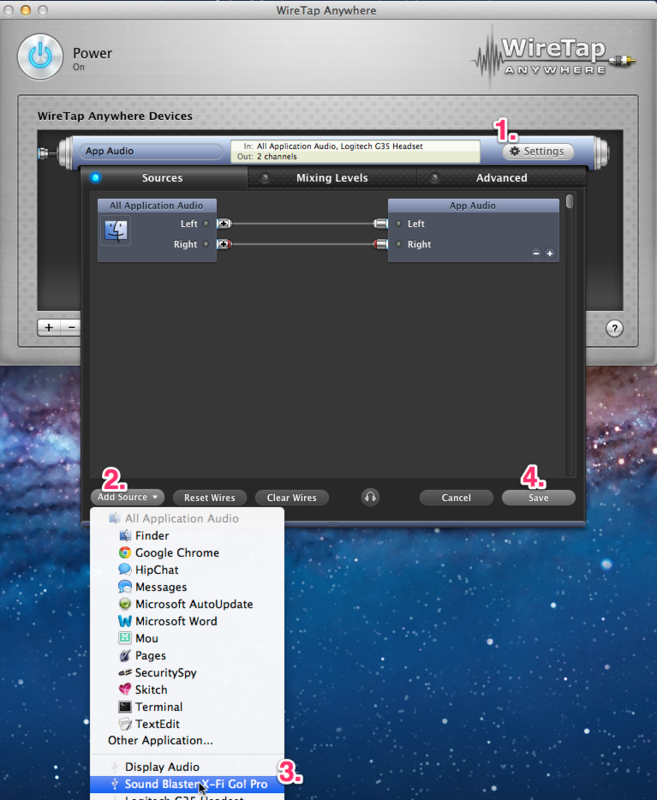 Note: The following instructions have been verified to work on Mac OS X 10.7.x (Lion). They will probably work on older versions of Mac OS X as well, but for best results, you should upgrade to the latest version. There are several pieces of software that you will need to download and install. Follow the installation instructions for each before continuing. CamTwist (Free). This is the software that captures your screen so that you can broadcast it. a) Wiretap Anywhere ($129/Free 30 Day Trial). This software takes the audio from your Roll20 session and your microphone and mixes them together so you can use both in your live stream. Without it, you would only hear yourself talking, not your players or the music from your game. We know this is expensive, and are looking to see if there are any other options that work better, but right now this is by far the best way to record the audio necessary to live stream on a Mac. 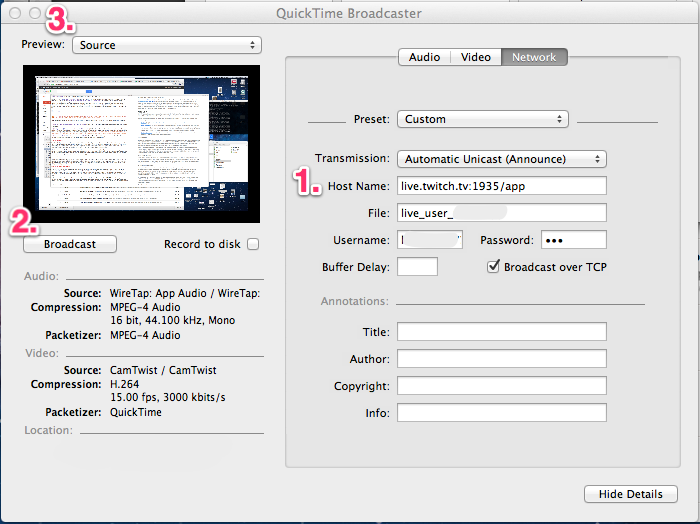 Quicktime Broadcaster (Free). This software (from Apple) takes the video from CamTwist and the audio from Wiretap and broadcasts it to the Twitch servers so that others can view it. Now that all 3 pieces are installed, you need to set them up and configure them. First up is CamTwist. Launch the program, and you'll be presented with a simple options dialog. You'll want to (1.) click on "Desktop+" and then (2.) click the "Select" button. Then in the far-right pane additional options will appear. You can choose to broadcast your whole screen (the default), or (3.) check the "Confine to Application Window" box to only stream your browser window (recommended). Finally, (4.) select the "Preferences…" menu from the CamTwist menu bar at the very top of your screen (next to the Apple menu). Choose the "General" tab in the settings dialog that appears. You'll want to (5.) enter 30 FPS in the Frame Rate settings box, and for (6.) Video Size choose the size you want to broadcast at (we recommend 1280x720 if your computer can handle it). You may need to fiddle with these options later if your broadcast is laggy. 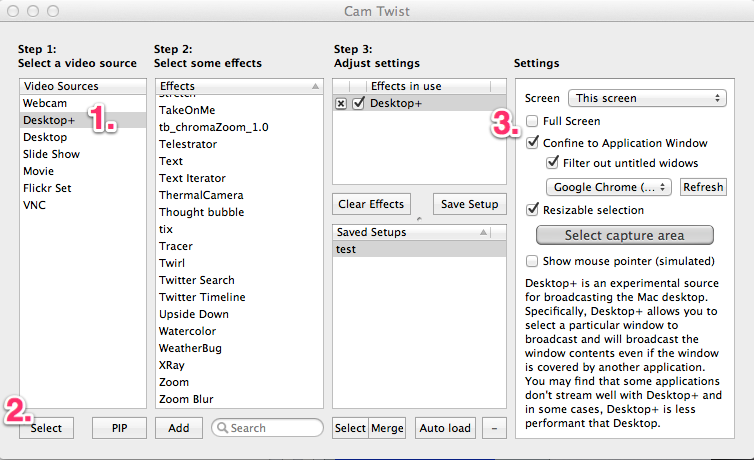 You'll also want to restart CamTwist after making these changes (being sure that all settings are correct after it restarts again.) You only need to change the Preferences… settings this first time. Launch Wiretap Anywhere. You should see a screen similar to the one below, with a virtual device already added. Click on (1.) the Settings button. Choose (2.) Add Source. Select (3.) the microphone that is attached to your computer. Click (4.) Save. Now when you speak or play any audio on your computer, you should see the meters in the "Preview Levels" box on the bottom of the window rising and falling to indicate that sound is being processed by the app. At this point both CamTwist and Wiretap Anywhere should be running and configured properly on your computer. 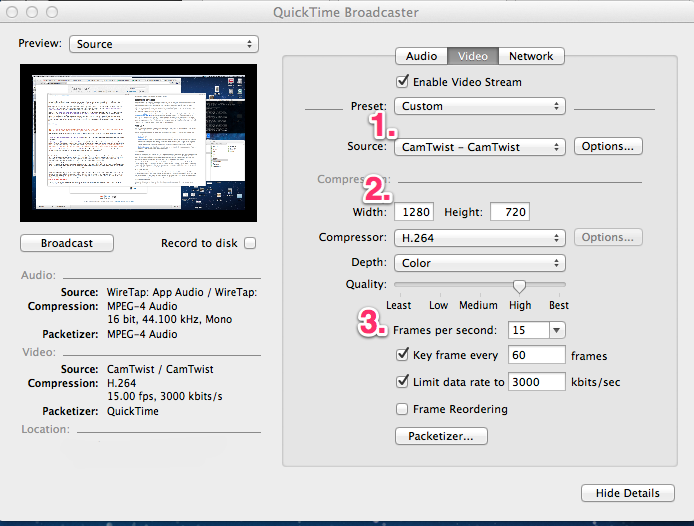 Launch Quicktime Broadcaster (it may take a minute or two to start up!) On the Video tab, you'll want to be sure to set up (1.) the source to CamTwist, (2.) 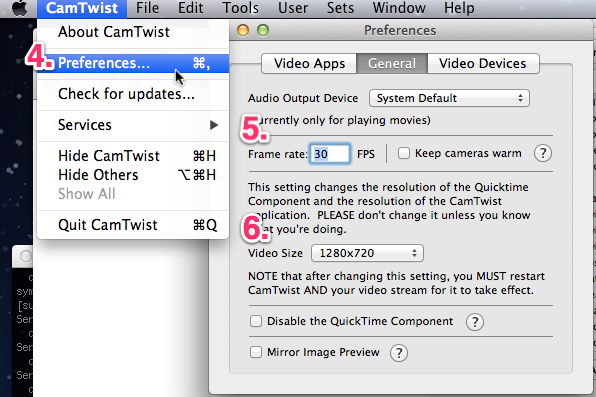 the resolution to match the resolution you have CamTwist recording at (again, we recommend 1280x720), and (3.) set the FPS to 15 or 30 FPS, the keyframes to 60, and the bitrate limit to 3,000 kbps (or less if your connection can't handle that speed). On the Audio tab, you'll want to (1.) make sure that WireTap is the Source, (2.) be sure that MPEG-4 Audio is the Compressor and the rate is 44.100 kHz (Mono). Click (3.) the Options… button, and in the settings dialog that appears, (4.) be sure to choose a decently high bit rate (we recommend 96 kbits/second). The Output Sample Rate should also be set to 44.100 kHz, and Encoder Quality to Best. Finally, on the Network tab, make sure that (1.) Transmission is set to "Automatic Unicast (Announce)". The Host Name should be "live.twitch.tv:1935/app". The File should be "live_user_your_twitch_username". So for example for us it's "live_user_roll20app". The Username you need to get from your Twitch.tv Broadcast page by clicking on the "Show Key" button. It should be something like "live_123456789_yfdsdfTESdfkDFsERRSLLFJ". The Password is always "jtv". When you're ready to begin your live stream, just click (2.) the Broadcast button! You don't need to have the Record to disk box checked, as Twitch.tv will automatically record the stream for you as your broadcast it on their servers. Finally, you may want to change (3.) the Preview box from "Source" to "None" during the broadcast, it makes it a little easier on your computer. During the broadcast you will see some information telling you the current bitrate and FPS that you are broadcasting at. 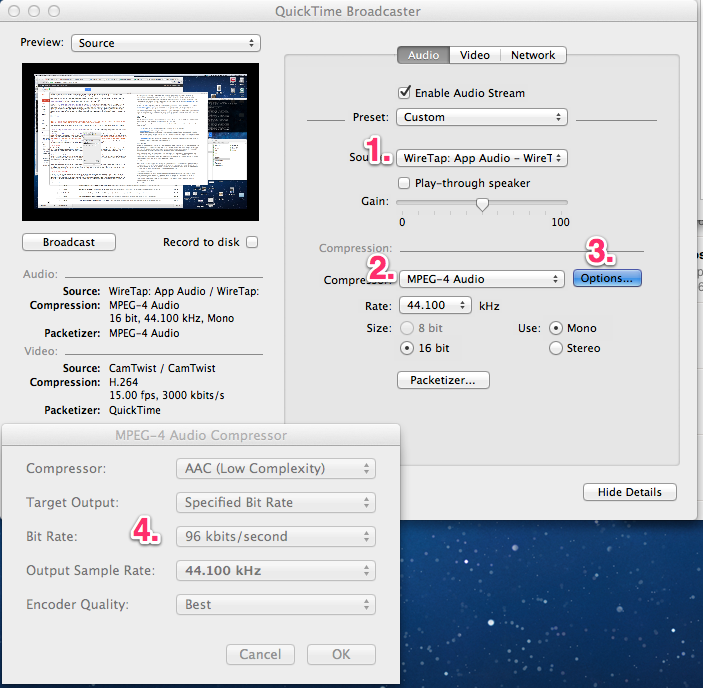 If the bit rate is too high for your connection or the FPS is low (less than 10), you may need to adjust some of your settings, such as the recording resolution in CamTwist and the broadcast resolution in the Video tab in Quicktime Broadcaster. This page was last modified on 27 April 2015, at 16:08. This page has been accessed 55,716 times.